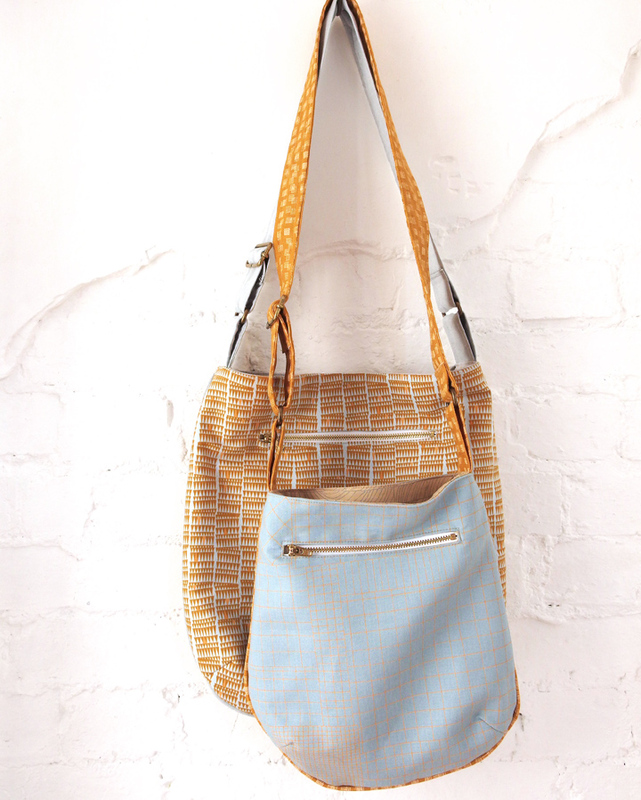 The pattern is from Anna Graham of Noodlehead, who is known for designing good looking functional bags and quilts. This one is no exception. We made the larger bag first, and it is a really good size – perfect for phone, diary, keys, small make up bag, notebook and pen, tissues, you can also fit an old iPad 2 in it comfortably without looking bulky. The straps are adjustable, so you can move it to a length you are happy with. We then made the smaller version using in the blue square, swirls tan and crosshatch mustard fabrics. We made this pattern about 1cm bigger than the pattern (all the way around) as we wanted to be able to fit a purse and notebook in it so it could be used as an everyday bag. The pattern is described as “Experienced Intermediate” and we would agree with that. The design is finished to a really good durable standard, lined with fusible cotton canvas, piping round the sides and a zip pocket. This makes it a good project for those of you who are comfortable with sewing tote bags, but want to push your skills a little further. Our favourite makes are those that look like you have bought them in an upmarket shop – and this project fits into this category. Just get ready for your friends to ask you to make them one! You can find more pictures of the pattern here. We are a sewing shop in Brighton Uk. We hands down, have the best stuff for sewing and creative textiles in Brighton!